To gauge the sincerity with which the candidate is approaching the school. Unique curriculum necessary to reach your goals. Faculty you are excited to learn from. School clubs or organizations you are particularly passionate about joining. Components of the program that intrigue you – study abroad, entrepreneurship project, etc. Aspects of your visit to the school (provided you have had the chance to visit) that really got you excited about being a part of the community – classroom environment, conversations with students, admissions officers, or other prospective students. When preparing your answer, select aspects that are unique to the program, and make sure your answer isn’t one that could be valid for other schools you are looking at. Hopefully this is an easy question for you to answer since you are legitimately excited at the prospect of attending the school. If the school is not a top choice, you still need to do the job of convincing your interviewer that it makes sense to offer you admission, and if admitted there would be a decent chance you would attend. Even if this is a “safety school,” you need to be respectful of the school and interviewer. 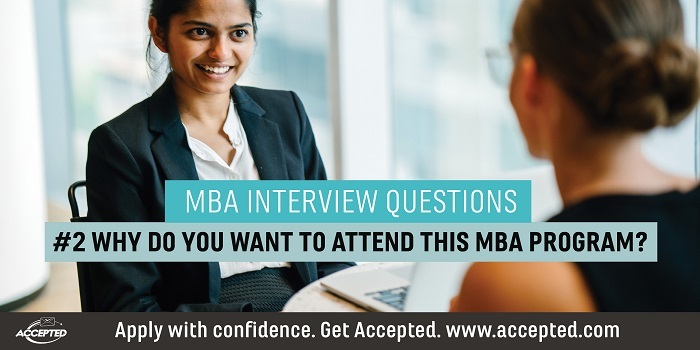 • Prepare for your Interview with an MBA Admissions Pro!